A dozen people were arrested today protesting the Obama administration’s continued detention and deportation of undocumented immigrants. President Obama is returning home to Chicago today—where he’s being greeted by waves of protests from across the political spectrum. Obama is in town to raise money at the local Hilton on Michigan Avenue, where a dozen undocumented immigrants and allies were arrested today, denouncing continued deportations. Although the Senate Judiciary Committee signaled some progress on a comprehensive immigration reform bill last week, a less watched committee considered the Department of Homeland Security’s 2014 budget. The Appropriations Committee approved additional funds to continue to maintain 34,000 detention beds for next year—conceivably the same year when a new bill would kick into gear. The budget also requests budget decreases for civil rights oversights, and for the immigration agency’s ombudsman. The continued focus on detention and deportation might signal that even if a bill passes through Congress, many immigrants will continue to be targets in the near future. As deportations continue, there’s been increased pressure on Obama to halt removals as a first step toward reforming a broken immigration system—and meeting him in Chicago seems a good opportunity to bring the message home. 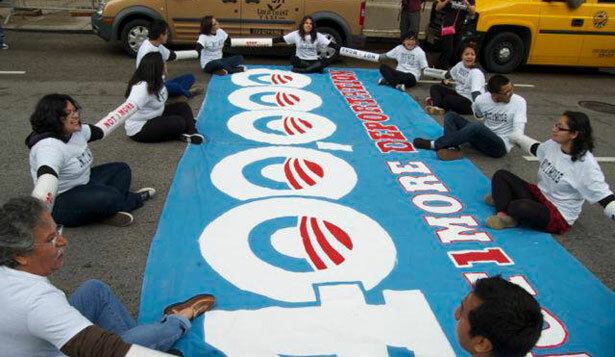 Activists are holding a protest this afternoon, demanding the president take executive action to halt deportations. As Obama arrives at the Hilton, family members who have been separated from their loved ones at the hands of the immigration authority will share their stories. They will be joined by demonstrators protesting against the Keystone XL pipeline, as well as those coming out against Monsanto. Anti-choice activists are also expected to rally. But this morning, a dozen people—undocumented immigrants and allies—bound themselves together outside of the hotel, in a civil disobedience to draw attention to continued deportations. They joined together around a massive banner that read “400,000”—representing roughly the number of people estimated to be deported this year. Authorities appeared confused about how to handle the situation, but soon began sawing through the piping that united the demonstrators, and arrested each one, one-by-one. Whole families risked arrest today in order to try to keep more families together. Why did Rutgers hire an athletic director with a record of abusing players—and lying about it? Read Dave Zirin’s take.